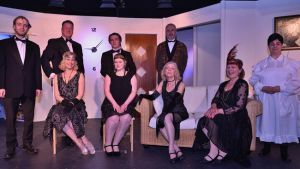 Hay Fever, one of Noel Coward's best-loved plays is a challenging to stage: the dialogue witty and fast, the changes of mood swift and the stage often full. And there's the 1920s to conjure up with set, music, costumes and props. So how did it go? I loved it. It's 1924; the Bliss's live a slightly bohemian life. Each of the family has invited someone to stay for the weekend, without telling the others. At the start, Sorel (Natalie Scurr) and Simon (Ned Murray) are comfortable, lively and have a real conversation....hard to do convincingly. I felt in safe hands. That matters a lot for live performance. Clara (Ann Dowson) is the maid....sees everything....feet firmly on the ground and no nonsense. Ann does that brilliantly; you can't take your eyes off her. Judith Bliss, the mother (Liz Crawshaw) is a force of nature. Judith is an actor, gets fewer good parts now; putting on a show is vital, even at home. Liz did an amazing job. She was witty, bitchy and turned on a sixpence between the two. Her lack of self-knowledge came across really poignantly. David, the father, (Euan Crawshaw) writes novels with moderate success. Self absorbed, vulnerable about his place in the family, he knows that real power lies elsewhere. But he does manage a bit of a personal adventure later. I thought Euan carried this off with great subtlety; there was real person behind the front. 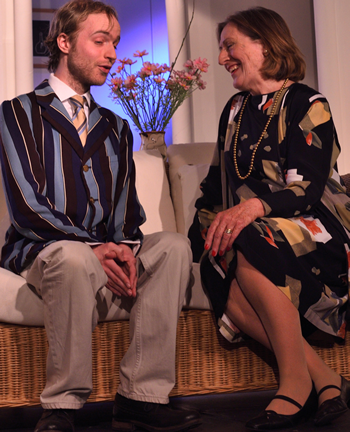 Sandy Tyrell (Thomas Jennings) sprang on stage in his stripey blazer and was enjoyable from the word go. His character was bright and confident and seemed at ease, even in the Bliss's unhinged household. Myra Arundel (Sheila Mowatt) is central to the play. She sees how the family works and is fearless. Sheila was astonishing; by turns vampish, acidic, athletic and with the occasional whiff of menace. Watch this space. Richard Greatham (John Law) is urbane and self-possessed. John, also relatively new to the stage, has great stage presence. the sort of authority that creates reality. Jackie Coryton (Lizzie Dimouli) is a real spark. She had a way of commanding attention with little gestures and reactions that was vivid and compelling. So, beginners and experienced actors worked together to make us laugh, to make us gasp at the bitchiness, the grudges, the self-delusion. The final scene where the family has breakfast arguing about theatre reviews is a gem. "One always plays up to mother" says one of the children. "No-one means anything in this house" says another. Enough said. It's a vast army that makes a play happen. Music, sets, props, lighting, publicity, prompting and doing refreshments on the night. These need unsung heroes with expertise. The Director thanked all after the final show, knowing that without them, nothing would happen on stage. Lottie Alexander, new to the village, chose the play, cast it and steered the ship to the triumphant Saturday night. With a huge cast to fill, Lottie found two professional actors (Thomas and Lizzie) and two people with lots of acting experience (Natalie and Ned), from outside the village. Members of the cast told me how they grew together. The result was subtle, funny, snobbish, sometimes vicious and occasionally downright dangerous. I loved it. Well done Lottie, well done everybody.